Although neurohumoral excitation is the hallmark of heart failure (HF), the mechanisms underlying this alteration are not entirely known. Abnormalities in several systems contribute to neurohumoral excitation in HF, including arterial and cardiopulmonary baroreceptors, central and peripheral chemoreceptors, cardiac chemoreceptors, and central nervous system abnormalities. Exercise intolerance is characteristic of chronic HF, and growing evidence strongly suggests that exercise limitation in patients with chronic HF is not due to elevated filling pressures or inadequate cardiac output during exercise, but instead due to skeletal myopathy. Several lines of evidence suggest that sympathetic excitation contributes to the skeletal myopathy of HF, since sympathetic activity mediates vasoconstriction at rest and during exercise likely restrains muscle blood flow, arteriolar dilatation, and capillary recruitment, leading to underperfused areas of working muscle, and areas of muscle ischemia, release of reactive oxygen species (ROS), and inflammation. Although controversial, either unmyelinated, metabolite-sensitive afferent fibers, and/or myelinated, mechanosensitive afferent fibers in skeletal muscle underlie the exaggerated sympathetic activity in HF. 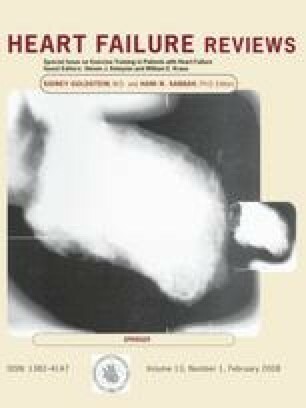 Exercise training has emerged as a unique non-pharmacological strategy for the treatment of HF. Regular exercise improves functional capacity and quality of life, and perhaps prognosis in chronic HF patients. Recent studies have provided convincing evidence that these benefits in chronic HF patients are mediated by significant reduction in central sympathetic outflow as a consequence of improvement in arterial and chemoreflex controls, and correction of central nervous system abnormalities, and increase in peripheral blood flow with reduction in cytokines and increase in mass muscle. Dr. Carlos E Negrao has been supported by the Fundação de Amparo à Pesquisa do Estado de São Paulo (FAPESP # 2005/59740-7) and Conselho Nacional de Pesquisa (CNPq # 304304/2004-2), Brazil, and Dra. Holly R Middlekauff by the National Institutes of Health (Grant RO1 HL084525), USA.